Cono Sur Bicicleta Sauvignon Blanc is a popular Chilean White Wine available from Tesco Groceries in 75cl to buy online. Visit Tesco Groceries for the best price for 75cl of Cono Sur Bicicleta Sauvignon Blanc or compare prices on our other Chilean White Wine products. Elegant, eloquent and with a green-yellow hue, this Sauvignon Blanc gives notes of grapefruit and green apple, which meld in with herbal traits. In mouth, its freshness and balance specially stand out, along with its citric notes and pleasant mineral ending. 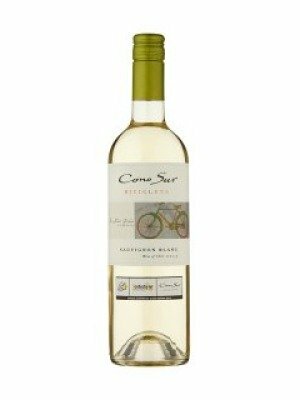 Where to buy Cono Sur Bicicleta Sauvignon Blanc ? Cono Sur Bicicleta Sauvignon Blanc Supermarkets & Stockists. You can buy Cono Sur Bicicleta Sauvignon Blanc online in most retailers and find it in the Chilean White Wine aisle in supermarkets but we found the best deals online for Cono Sur Bicicleta Sauvignon Blanc in Tesco Groceries, Tesco Wine, and others. Compare the current price of Cono Sur Bicicleta Sauvignon Blanc in 75cl size in the table of offers below. Simply click on the button to order Cono Sur Bicicleta Sauvignon Blanc online now.